Last night, the kids stayed the night at my parents' house, and Jerry had the night off work, so we got to have a date night! Usually, our "date nights" consist of us staying at home and watching a movie or something, but we actually went out yesterday, and it was a lot of fun. First, we went to Panera for dinner. I've heard from a lot of people that Panera's Fuji Apple Chicken Salad is really good, and I was in the rare mood for a salad yesterday, so that's what I ordered. I was so disappointed when I tasted it, though! I really didn't like it--the dressing was really sweet, and the color and texture grossed me out. I'm sure there was nothing wrong with the salad--I just didn't like it. I wasn't going to say anything, because it wasn't their fault that I didn't like it, but Jerry politely told them that I didn't care for it, and they were SO nice about it. They offered to make me something different, so I had the Asian Sesame Chicken Salad instead, which I've had several times and really like (and it had three less PointsPlus than the Apple salad). After dinner, we headed home, and then walked to a local bar for drinks and Keno. There are only two places (other than homes) within walking distance from my house--a little corner store and a bar. I had never been in the bar until last year, but I really liked it. Apparently, it used to be really run down inside, but there is a new owner and they did a lot of work on it. They have live music on Friday nights. I went there with Jeanie and her friend Jen the night before Jeanie's marathon, and I told Jerry about it, so he wanted to go check it out. I'm not normally a gambler (the only time I've ever played Keno has been with my sister), but Jerry and I each decided to play $20 in Keno. I filled out my number selection (11, 25, 33, and 69) and then Jerry filled out his. When I saw his numbers, he'd chosen 11, 25, and 33 also! I told him he can't pick the same numbers as me, because that wouldn't be any fun, so he needed to hurry up and fill out a new form with different numbers. The server was waiting to take them, so I gave her our money, and hoped she'd give us our printed ticket before the next drawing. There were only about 20 seconds until the next draw, so I figured we'd miss that one, but she came back with our tickets and we were included in that current drawing. 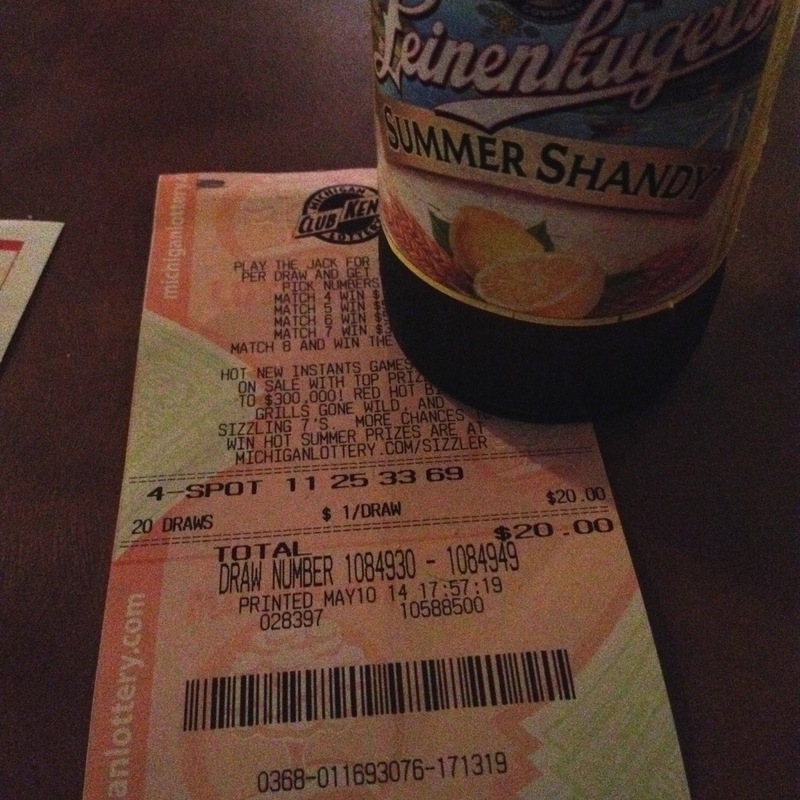 Jerry never plays Keno either, so I was trying to explain to him how much he'd win for each of his numbers drawn. This morning, I had a long run on the schedule. I've been following the Hansons' "beginner" plan, but it's very similar to the advanced plan (slightly less miles for the beginner). For some completely crazy reason, I decided that I'd do the long run for the advanced plan today--14 miles (as opposed to 12). I drove to the Metropark and parked at the Marina, which is at the very end of the park. My plan was to just run an out-and-back from there. 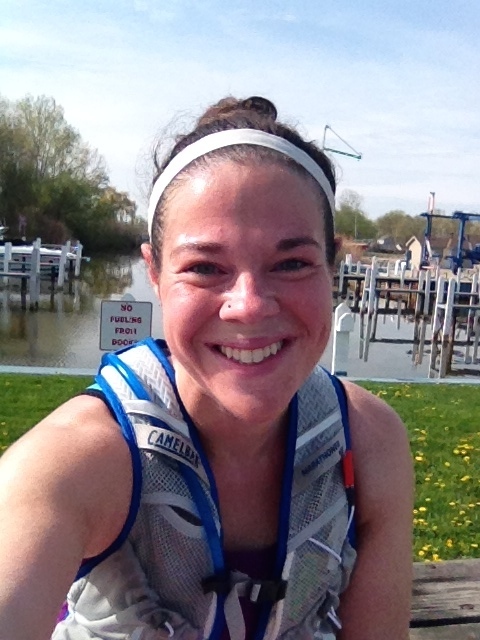 I wore my Camelbak Marathoner vest, so I wouldn't have to worry about water. I knew I'd need water today, though, because it was warm outside and the sun was full force. My target pace for a long run is 9:53/mile. Last week, I went way too fast, because I was in a hurry to finish, so today I wanted to stay close to 9:53. Today's run was SO tough. All the confidence that I gained after last week's long run vanished after today's. My body just didn't want to move today. 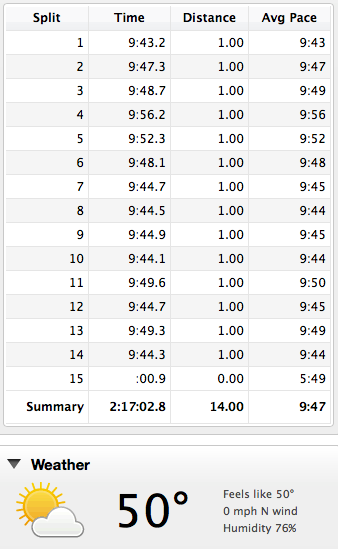 I was running close to a 10:00/mi pace, but it felt so much harder. I didn't have anything to distract me from the fact that I was running, either. Last week, it went by so fast because there were cyclists throughout the whole path. Today, it was just me and my lonesome. I was SO glad that I'd decided to bring the Camelbak with me. For the last several miles, I was so thirsty that I was sucking down water every half-mile or so, and eventually every quarter-mile. My half-marathon split was 2:08, and from there, I thought, "I could just stop my watch here and then walk the rest of the way..." but I pushed myself to keep going. Finally, I saw my car, and was SO relieved. I sat down on a picnic table to catch my breath and relax for a minute before driving home. I had to go into Wal-Mart this afternoon for just a minute, and while I was there, the woman who had been in front of me in line recognized me from my blog! (Hi, Jessica!) I'm used to one or two people knowing me at a race, but very rarely when I'm out and about. The rest of the day was pretty relaxing, which is just what I wanted :) My kids gave me a couple of handmade gifts from school, which I love. I told Jerry I didn't want a gift for Mother's Day, because I just got the Fitbit. But he got me something that I'm really excited about, even though a lot of women might be offended by it--the Aria scale that goes along with the Fitbit! It's a "smart scale" that automatically uploads my weight to my Fitbit account. I'll write more about that another time--this post is long enough. I hope all you moms had a fantastic Mother's Day! I asked one of my friends if he got a gift for his wife. He said "yep." "What?" I asked. "I mowed the lawn," he said! I look forward to hearing how you liked it! Congrats on the run! It´s so inspiring that you pushed through! I've found that the Aria scale weighs me as heavier than my scale--by about 1.5 pounds! But it does seem to be consistent, which is most important to me. Ooh that scale sounds interesting! I am on like day 4 of wearing my Fitbit Flex and I'm really not sure what I think. When I can have less calorie burn for more steps, more active mins than a day with less steps and less active mins that really makes me question how the thing works. I have not played Keno, but that sounds fun! I need to see if they have it in my area. Just wondering if you had a few more drinks than usual when you went out the night before your long run? I read Oprah's book (Make The Connection) and her trainer (Bob Greene) told her drinking would affect her runs. She didn't listen and had wine (a few glasses) with dinner. She was kicking herself during that morning run! No, I'd just had two beers, and it was at about 6 pm. Trust me, I've run after drinking much more than that before ;) Not sure what the deal was that day! i acutally like the fuji apple salad but i know what you mean about the dressing being too sweet. i never had that asian one though so ill have to try it. i was thinking the same thing when i saw your selfie.... "looks like she had a fine run" haha. you play it off well. some days for one reason or another are harder than others. maybe take it easy tomorrow w your run, cross train, or rest. youre not alone though. and for struggling during your run...to be able to keep those splits very consistent...that is awesome. good job lady!